Futagoyama Oyakata, struck by cancer, leaves the hospital in order to greet his pupil on the dohyo. 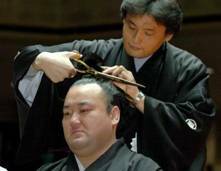 On January 30th at the Kokugikan, Takanonami Sadahiro climbed the dohyo for the last time, this time in order to get his precious oicho-mage (topknot) cut. For this ceremony in honour of the former Ozeki who held that rank for 37 tournaments, which is the 4th longest reign in history, 400 honoured guests gathered, including the former stars Akebono, Musashimaru and Wakanohana. But the event of the day was the unexpected arrival of Takanonami's previous master Futagoyama Oyakata, former Ozeki Takanohana. Futagoyama, once a passionate smoker, suffers from cancer and was hospitalised in Tokyo. Wishing to pay his respects to his pupil, he decided to leave the hospital in order to take part in the ceremony. When he arrived after a 10 minute delay the audience showed their admiration with resounding applause for the former prince of Sumo, and his pupil was unable to hold back the tears which he successfully restrained until then. After this highly emotional moment, the ceremony was concluded by the current head of Takanonami's heya, unrecognisable Takanohana. Takanohana Oyakata, who lost over 50 kg, makes the final cut. Mainichi: You were active during the golden age of Sumo, together with the Hanada brothers, Takanohana and Wakanohana. As you were always next to them, what were your feelings at that time? Takanonami: I didn't play a major role in that period, but I didn't resent that in the least. No matter how my training was, either in quantity or in quality, I knew that the next day newspapers wouldn't mention a word about it. Being in the shadow as I was, I could have succumbed to frustration and said: "Well then, there will be no training today! "; but even then I was also aware that if I didn't win my bouts the journalists would surely mention my lack of training. All in all, it was a very stimulating situation. Mainichi: You were gifted in your Sumo, which consisted of drawing your opponent to yourself to better entrap him, but it exposed you to a lot of criticism, isn't that so? Takanonami: I didn't worry about the criticism at all. When I was at the height of my strength as Ozeki, the hall was filled every day and my only worry at that time could be summed up in: "Did the spectators despise my performance?" When I climbed on the dohyo I would become nervous, but only with the thought of pleasing the audience to pay them back for all they did. In any case, when I would hear the shouts from the audience, I would be filled with desire to get on the dohyo and win to make them happy. This pattern repeated itself throughout my career. Mainichi: You have won two yusho, and with them a chance of becoming a Yokozuna, isn't that right? Takanonami: You know, I never thought about that, chances of promotion, wins or defeats. The only thing on my mind was the desire to bathe in the shouts of the audience, and even more, the wish to hear my previous master (Futagoyama oyakata, Takanohana's father) compliment me on my Sumo. That said, I admit that once I was away from the dohyo, my mind calm, there were times I imagined myself in someone else's shoes. Mainichi: What did your master teach you? Takanonami on January 20th, with his wrestler's "mage". Mainichi: At the moment, Sumo is dominated by Asashoryu, who is untouchable. What are your thoughts? Takanonami: Asashoryu truly fights with all his strength. But, as it is obvious that he acts on all occasions as if his life depended on it, the conclusion is that other wrestlers don't do enough. It doesn't even seem that they are bothered by this situation. For example, I've never seen him suffer tsuppari to the head from someone really boiling with rage to win against him. There is a lack of ambition among the others, which the audience senses, unfortunately. In the end, after considering it all, one realises that there is a gap too substantial to be filled quickly. Mainichi: Promotions of Kaio and Wakanosato were expected, but in the end they both failed. Your opinion on that? Takanonami: This could apply to current wrestlers in general. They fight with fear in their gut, with a lot of calculations on their minds. Instead of focusing on their own Sumo, they worry about their statistics too much, which completely affects their Sumo. When I was promoted to Ozeki, I only thought of one thing: "Now that you are more often on television, show them something that resembles you." Considering how Wakanosato kept his place among the Sanyaku for three years, it is obvious he is made of the right material for advancement. What he lacks is probably mental strength, that irrepressible desire and will to break the opponent. Mainichi: What do you think of this wave of foreign wrestlers which is becoming stronger and stronger? Takanonami: At the time when Takanohana, Wakanohana and I crossed swords with Akebono and Musashimaru, the audience had someone to trust and side with, we were defenders of their flag. For that reason, I would really like for Japanese wrestlers to rise from the ranks in order to manhandle Asashoryu. I would like to see them climb the dohyo with that awareness and with the desire to reverse this trend. If they are valiant, even if victory isn't in sight, they will always be able to count on the encouragement of the audience.